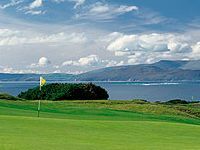 A "links" golf course, sometimes referred to as a seaside links, is the oldest style of golf course, and was first developed in Scotland. Many links - are located in coastal areas, on sandy soil, often amid dunes, with few water hazards and few, if any, trees - this is the main characteristic of a Links Course - ´´one on the coast´´. The challenges of links golf fall into two categories. The courses themselves, which tend to be characterized by uneven fairways, thick rough and small deep bunkers known as "pot bunkers". Secondly, due to their coastal location many links courses are frequently windy. This affects the style of play required, favoring players who are able to play low accurate shots. 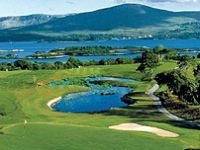 Links courses remain most common in Ireland, Great Britain and Scotland. The Open Championship is always played on links courses, which is one of the main things that differentiates it from the three major championships held in the United States.